Vanessa kershawi, commonly known as the Australian Painted Lady, is a butterfly that is mostly confined to Australia, although westerly winds have dispersed it to islands east of Australia, including New Zealand. There is debate surrounding the taxonomy of this species. Some believe that the Australian Painted Lady should be a subspecies to the Painted Lady due to the similarity in lifestyle and behaviour. Furthermore, the Painted Lady is found around the globe but Australia is the only location in which it varies enough to be considered a separate species. However, due to the distinct genitalia of the males, and variation in coloration, many others consider the Australian Painted Lady to be a separate species. During spring, adult butterflies migrate south in large numbers from northern states of Queensland and New South Wales. In order to find mates, male Australian Painted Ladies exhibit territorial behaviour, which involves a male perching on vegetation in a sunny spot on a hilltop, waiting for females to fly by. 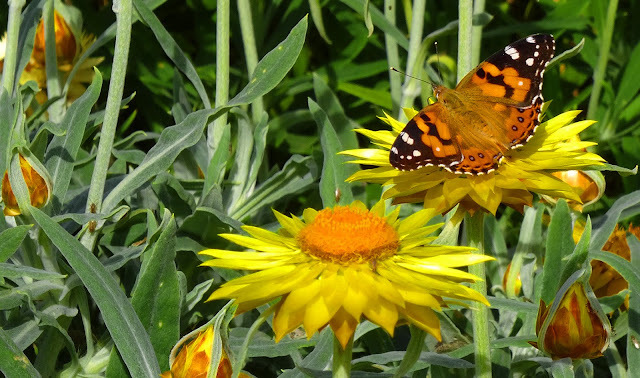 Despite urbanisation and invasive plants altering its habitat, populations of Australian Painted Ladies have not been significantly impacted by these changes. Hello, wow! This is so colorful and pretty. Lovely butterfly capture. Thank you for linking up and sharing your post. Thanks also for the comment on my post. Happy Saturday, enjoy your weekend! Beautiful shot of the butterfly and the flowers. Great colors. This painted lady sure knows which color compliments her portrait best. Beautiful!